The controls come in a few variations due to the different stages in the game. Once you enter the game you will be in a ship with all other players. Pressing space will allow you to exit the craft. However it is advised to strategically plan your dropping point by having a look at the map. This can be opened with m. A simple left mouse click will allow you to place a waypoint. This will make it a lot easier to figure out where to go. So after leaving the craft you will be in a shuttle dropping down into earth. Using w-a-s-d you can move around slightly. Pressing space will toggle the thrusters. Having these active will allow you to fly and drop at a slower pace. With this you can easily reach your waypoint if it is far on the map. Once landed you will be in a small simple car a small mech. This has been changed for convenience. Each and every single vehicle in the game have w-s as forward and backward controls. For left and right you will have to move your mouse to look around. Alternatively you can use a-d for left and right. This however only works properly when you are looking around with the camera. To achieve this you have to keep alt pressed. When you are close to an unmanned vehicle you can press e to enter it. It will have a blue glow around it for you in order to notice it. If you are in a vehicle that has legs then it has the option to jump by pressing space. You might find yourself in a pickle where you get stuck or are somehow upside down. Pressing f will flip your bot over. Be aware that this takes about 5 seconds and makes you quite visible in your surroundings! These vehicles also share the same basic controls as the ground vehicles. However space increases your altitude while ctrl decreases it. This makes it easier to hide at the ground or go up high in the sky to have a great overview of the area underneath you. In order to be victorious you will eventually have to be aggressive in order to win. This can be achieved by attacking the enemies. The keys 1-2-3 hold weapons/power-ups and pressing the key will select it. Weapons and power-ups can be fired/activated by pressing the left mouse button. 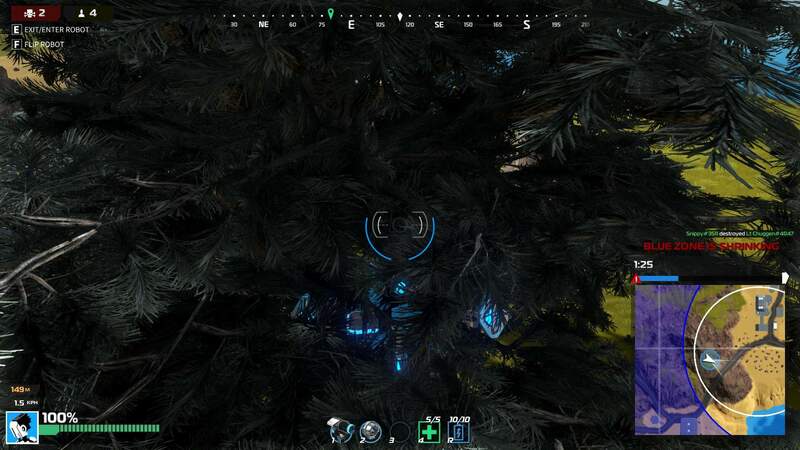 Using the right mouse button you can zoom in a bit, or if you have a railgun (sniper) you can scope. It will make it a lot easier to hit your target. There are homing missile launchers in the game. This has a lock-in mechanism, meaning that you have to wait a little bit for it to lock on the target, locking is done by zooming on the target with the right mouse button and following it. After that you can fire with the left mouse button. The missiles will home into the target. If it isn't locked then it will simply fly straight forward towards the aimed direction. It is possible that you end up partly destroyed with no repairs around. 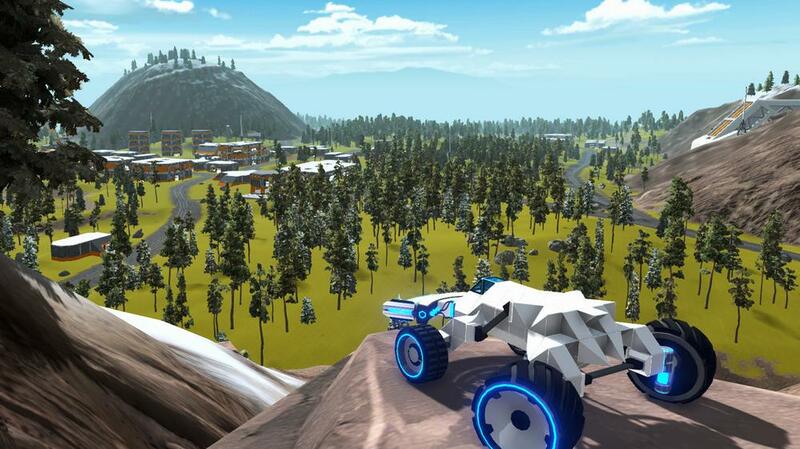 Pressing e will allow you to exit your robot and enter the small start-up car. This takes 5 seconds which can't be interrupted. So it's impossible to do during combat. 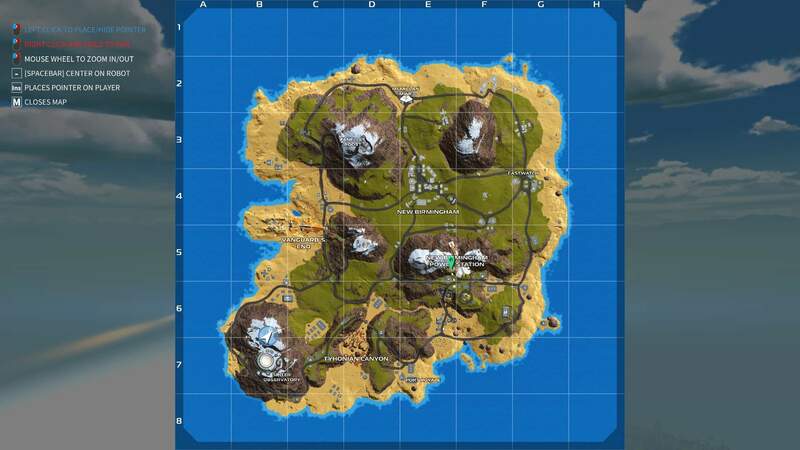 Around the map there are many blue and green items scattered. These are mainly found in buildings. Simply going through them allows you to pick it up. The green ones are used for healing/repairing while the blue ones simply refills the ammo. Once you have at least one ammo pick-up you can press r to reload. Once you have at least one health pick-up you can press 4 to repair yourself. These all can be done during combat or when a power-up is activated without canceling the effect of it. With many robots comes many types of weapons. These can be categorized in just a few classes. I will only cover the classes and not the weapon specifications. These are the most basic and simple weapons in the game to use. Simply aim and shoot. Spray and pray. They come in a few sizes with the small ones having a high fire rate vs low damage while the bigger ones come with quite a lot damage with just a little bit slower firing rate. Depending on their size the energy drain increases, meaning you have to reload more often. However the biggest ones can destroy simply vehicles in just 3-4 hits when aimed properly. They are also effective at long distance shots. These require a lot more skill to use properly. The balls fly a lot slower, meaning you have to predict your enemies movement. On top of that you will have to get used to gravity as well, however once you land a hit the damage will be enormous, compared to lasers. These come in their respective sizes as well. Their energy drain is a lot more than that of the lasers. The shotguns come in just 2 variations. A small and a big one. Both of them do tremendous damage, but they are only effective at close range. It is adviced to go with vehicles that have these weapons when you are used to moving fast in circles around the enemy. However if you can sneak up on an enemy you will need max 3 hits to kill it. The enemy won't even know what happened. The only weapon on your starter vehicle. Some other vehicles have this as well. While they might seem useless and weak (they actually are that in this game) they can shred easily through ground units. If you are able to hit someone with it, it will be only a matter of seconds before you gain another kill for your incredible killstreak. This is quite an unique gun. It only has 1 variation. The PSK has bullets that automatically home to an enemy within its vicinity that is close to you as well. If you are close to hitting it with a normal laser then the PSK will definitely hit it. However the damage is extremely low as is the energy drain. Chances are that you are dead before you can kill the enemy with this weapon. One bullet, one kill. That's the saying that most snipers use. This however doesn't have a bullet and the odds of you getting a 1-shot are pretty low. However with a high damage drain and a small waiting time in order to fire again you do get a massive damage output. Land a few shots while scoping through the environment and you are certain to increase your killcount (if you hide properly). Lock on to your target and pew pew pew! The homing missiles will follow the target until it runs out of flight time or collides with the target or an obstacle. These are extremely powerful against air vehicles as they can't hide easily. 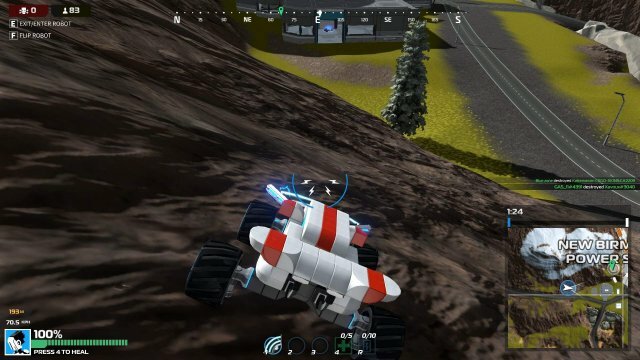 If you are on high grounds you can take out ground vehicles easily as well. Extremely high damage at the cost of difficulty in landing it as well as the ease of dodging it. This is probably the most difficult weapon in game to use properly. It launches a major grenade that explodes on impact. You will have to calculate the trajectory based on angles and predict where it will land. If it hits the target it will pretty much immobilize it. It also has a big area of damage which decreases the odds of missing significantly. The true spray and pray weapon. Firing a lot bullets per second will shred any enemy at close range. It is also able to do long distance shots with a low accuracy. This weapon comes in 2 variations and both have an extremely low energy drain per bullet. I am not certain if this is in the game yet as I yet have to encounter it however I will cover it anyway. This weapon is made to be used against aircraft. Using it against ground units will simply result in you wasting energy. The bullets explode when it is near an aircraft, meaning you don't have to snipe. Hitting a target once allows you to fire another bullet rapidly shortafter. Those pesky flying enemies will just be a problem solved in a matter of seconds. Slow speed but can move on any terrain type. It has struggles to climb steep hills, but it has a lot health, meaning it won't be destroyed in a few hits. These legs allow you to run around the map extremely fast. They also allow you to jump around. You can cover a lot ground in a short time, even when climbing a mountain. These are the same as sprinters, they simply just have a slower speed but more individual health. These are legs that look like those of spiders. And as spiders you can climb walls with it. Having a sniper and standing on the side of a building can result in extremely good cover and places to snipe from. They are also very mobile but slow compared to most of the other movement types. These are the wheels found on your starter vehicle. They allow you to drive extremely fast. If you are low on time for the safe zone then this might just be the wheels that can rescue you. Extremely mobile and quite fast. 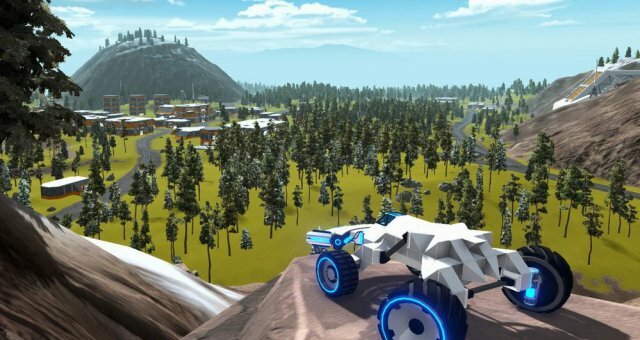 Hovers will allow you to cover any type of terrain without any worries. The only downside is that to stop the floating movement you will have to go backwards in order to bring the speed back to 0. Standing still is quite difficult due to this. A huge pro with this however is that they are completely silent. Enemies won't hear you coming! Perfect for the ninja's between us. Loud, noisy and easy to hit. These guys are fast and very agile. Don't underestimate them. But they don't have cover up in the air. To make up for that you have a great view on the ground units. Raining down your bullets from hell have never been so easy... unless they enter a building. Flying with control. Unlike a plane you can hover at the same position high in the air. You can even go down pretty quick to the ground if you spot an enemy that has anti air weapons such as missile launchers and flak cannons. The smaller ones can easily enter buildings as well to fight the ground units. Do note that these are extremely loud. Enemies will know that you are around before you can even spot them. Power ups are used in weapon slots as well. They can give you a huge advantage over your enemies. Consider yourself lucky when you encounter a vehicle with a power up. Each power up only has a single version and they all have their own cooldown period after use. 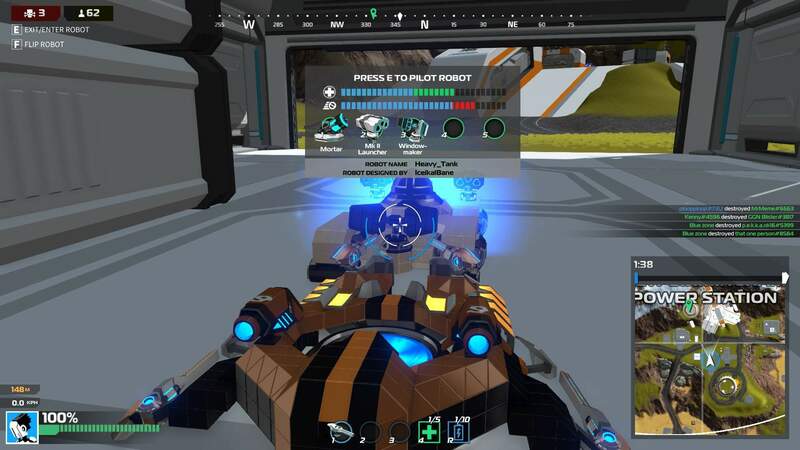 These are different from the original Robocraft as confirmed by a dev as well as experienced in game. This has quite a huge radius and you can't damage yourself with it. Aim it on an enemy and he won't be able to move/shoot for a couple of seconds. The area of effect is a cylinder shaped, meaning it also affects aircraft even if you aim it on the ground. As long as they are in the circle they will be affected and start to fall. In a tough spot? This might just be your saviour. Aim it anywhere and teleport to that place. This can allow you to hide easily or teleport right behind your running target and slaughter them. In a heavy firefight nothing is better than a shield through which only your bullets go. This shield allows you to move through it as well as your bullets. Perfect for cover in a firefight and it will increase your chances of taking the enemy down. The shield only lasts for about 10 seconds, but this might be just what you need to repair. Got some good weapons? Why not sneak up behind your enemy with this module. It will drain energy slowly as long as your are stealthed, but you can sneak up on anyone. It is hard to spot (but possible) and hard to hear (but possible as well). It is possible to reload your energy, meaning you can be stealthed for extremely long. Shooting your weapons or getting hit removes the stealth effect. 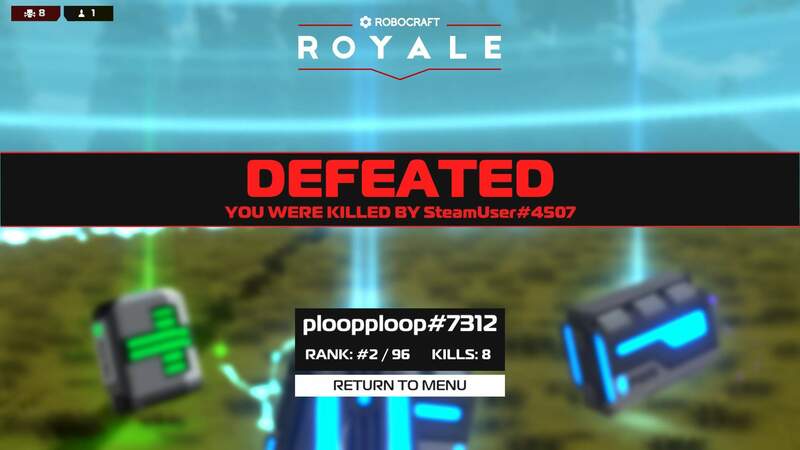 I am not sure if this is in Rc Royale, but I will cover it anyway. This module once activated restores your energy completely instantly, after that it will be on cooldown. This is extremely useful incombination with heavy energy demanding weapons. Activating it when you are almost out of energy means that you can overwhelm the enemy. You basically always carry an extra ammo pack with you that can be used like once a minute. This highlights the position of nearby enemies on your screen for about 10 seconds. Great for when the map is small or when you suspect enemies to be nearby. Sneak up on them after knowing their position and show them who deserves to be in the top 10. So now you know the basics of the vehicles, weapons and controls it's time to get down to strategy. While it is cool to show off how many kills you've gotten it might sometimes result in you getting overwhelmed. Sometimes it is better to stay hidden and have a low killcount while the others butcher each other up. In the end of the day the game is about winning not killing (even though you will only have 1% chance of winning without killing). This basically means that you should only kill when neccessary. Don't engage into meaningless combat. You might use the supplies that you would just need for the final showdown. It is better to win with only 1 kill than to lose with 29 kills. Because in the end, you'd still be a loser. It is possible to place waypoints on the map. Use this to your advantage. Place a waypoint in a position where you want to hold out until you have to move to another position. Having the mark on your radar might just help you to manouver around the enemies to get to an advantageous position. In a game like this the terrain is your biggest friend. Use it to your advantage. High ground provide great overview for ground units while low grounds provide amazing cover against all sorts of enemies. There are many probs around the level that can help you staying unsighted. Hiding behind a rock for cover or in the leaves of a tree can help you remain undetected. You can also use buildings for cover from aircrafts. Some vehicles also blend in with certain terrain making you look camouflaged. Use this to your advantage as well in the environment. Stick close to waters with blue colors and close to snow with white colors. The harder you are to spot, the easier you will end up in the top 10. Sometimes you will have to face-off with an aerial enemy while you are just a race-car. The best strategy is to make them waste their energy. While you move from building to building to rack up repairs and energies they will have no place to do that as well. Once their energy runs out you can easily kill them even with inaccurate weapons. Energy = ammo so if they shoot you and miss then you will be another step closer to hauling that kill in. It is a patience game, but you will get there. Do move in unpredictable patterns and not just straight lines so that they won't hit you, or at least not as often. Another strategy might be to switch from vehicles. Sometimes you have to admit that you are outclassed. A shotgun won't hit that 100ft high helicopter. But a laser might just work. Usually you will face-off against similar classed vehicles; ground units. Taking them down can be quite difficult because if you can hit them then they can hit you. Unless it is a sniper vs shotgun ofcourse. The first rule of thumb is stopping their firepower. Right now an EMP would be great. Hitting the guns will destroy it quickly. If you notice that the player is panicking or not as impressive as you then you can destroy the wheels/legs so that it can't move while you slowly butcher it apart. It is possible to quickly kill a huge chunk of the enemy. Most people will go with the strategy to slice them in half since the biggest chunk will remain and the other chunk will be destroyed. This is an efficient and quick method of tearing through your enemy. If you happen to have a high damage weapon then simply aim at the centre of the body to blow a hole in it. Depending on the hole you can destroy the edges and the enemy will be defeated in 2-3 hits. A shotgun is the perfect weapon for this. Modules are ingame for a reason. They give advantages, sometimes even unfair when used properly. Using stealth on a nearby enemy is great to either run away or kill him without taking damage. It's up to you how to use it, but certainly don't think that they are useless. Most people simply forget using them or use them when they didn't actually need it. Save it for when you are in a pinch or when you know that you have enough time after the fight for the cooldown to finish. You won't win the game in an epic happy face looking vehicle. You will win with a vehicle that has decent weapons and that blends in with the environment. So sometimes you see something cool, but if your remaining enemies are all aircrafts, then it might be wiser to just stick with the ugly sniper weapon or missile launcher. During your travels on the map you will be in different environments. Changing from vehicles that blend in well is extremely important. You can also switch from vehicles when your current one has taken damage and you find one that is undamaged. You won't waste a repair package on it unless you are surrounded by repairs. You can reload during combat and you can hold 10 of those packs. Use them when your energy hits 30-50%. You don't want to be without energy mid-combat so make sure to use them well. After killing an enemy chances are high that it will drop a few packs as well. And always fully reload after combat while searching for new packs.